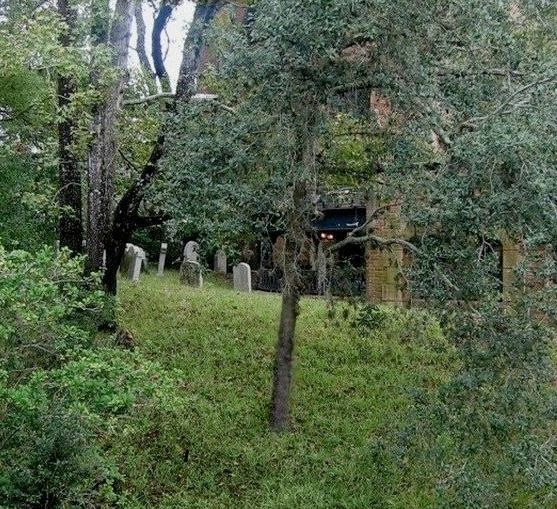 Back in May we went through a pretty lengthy history of the berm graveyard. 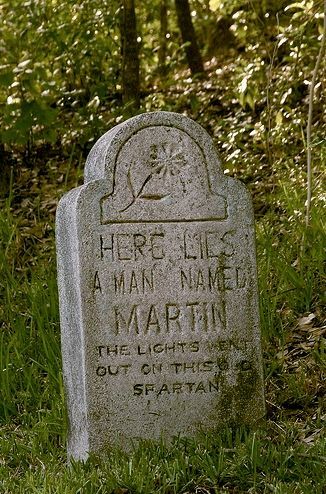 This time around I want to call attention to one particular stone, beneath which lay "A Man Named Martin," according to the epitaph. 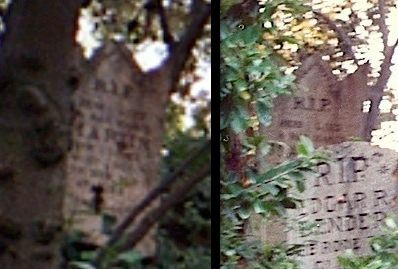 Even barely-decent photos of the DL version are rare, and over the years it was often so obscured by the bushes that it was practically invisible, tucked away in the extreme upper left corner of the graveyard, easily missed, easily forgotten. Blurry as they are, until November of 2016 these snapshots were nevertheless the best photos of it I had seen. 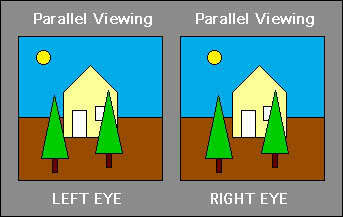 seem to be spaced erratically. Was the person who made this headstone . . . stoned in the head? It's embarrassing enough to make you almost regret that these new photos came to light. Almost. 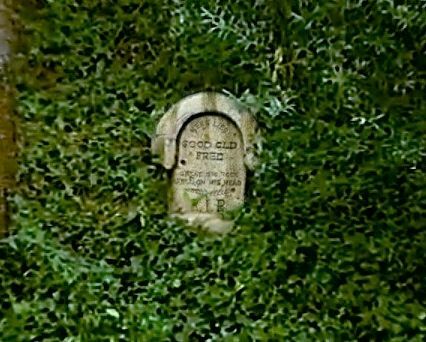 The WDW Martin stone has always been in plain sight in the HM graveyard. 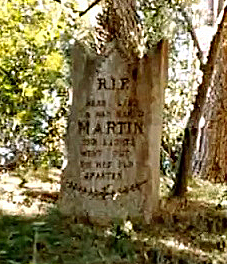 The Martin stone was located near the back of the whole graveyard . . .
years of exposure, making it a little difficult to read from the queue. Who Is the "Man Named Martin"? Now that we've pulled Martin out of the shadows and placed him center stage, we have an essential task to perform. Like nearly all of the original stones, "Martin" is a sly tribute to one of the original HM Imagineers. However, this tribute stone has fostered more confusion than any other. It has been awarded to two different Imagineers in the various sources, which are about evenly split over the matter. To make matters worse, some sources add to the confusion by conflating the two men into a non-existent Bill "Bud" Martin. On the one hand there's Disney legend Bill Martin. You can read some of the details of his stellar Disney career HERE. 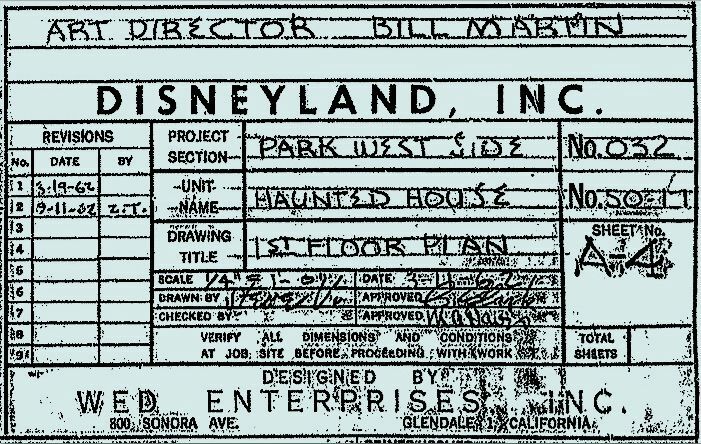 Bill was a key planner and one of the most important layout designers in the development of the Disneyland park, and he is prominently credited as Art Director on all the old 1962 blueprints of the Mansion exterior and grounds. It's a safe bet that Bill Martin has a LOT to do with how the building and its beautiful surroundings look, even to this day. 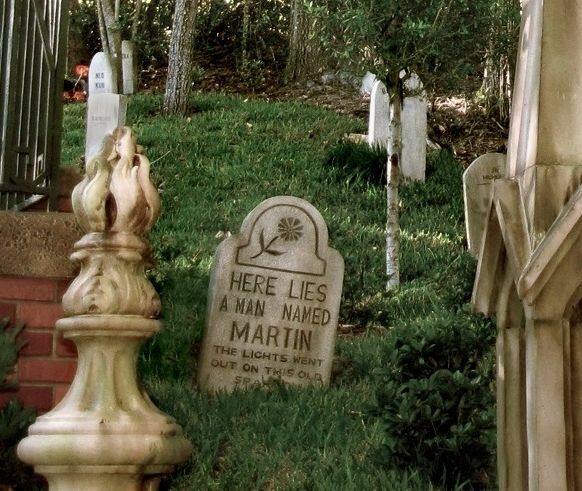 Whether or not he is the "Man Named Martin," few would deny that Bill Martin deserves a tribute at the Haunted Mansion. 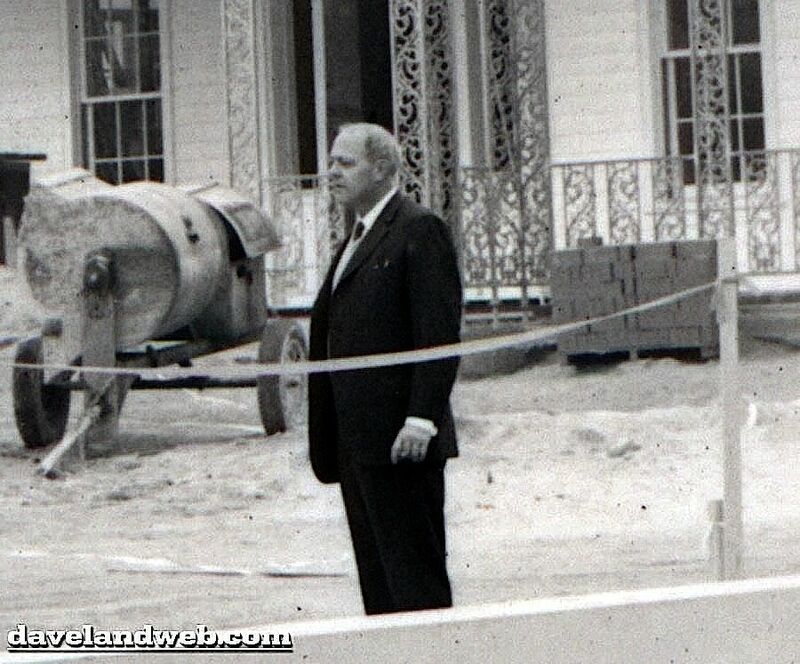 Here's Martin onsite at the Mansion during its construction in 1962. The other candidate is Bud Martin. Information about this Imagineer is much harder to come by. Fortunately, Alan Coats, son of Imagineering legend Claude Coats and an Imagineer in his own right, trained under and worked with Bud, so naturally Alan knew him quite well. He was kind enough to supply me with the following information. Bud Martin had already worked at WED (= WDI) for a number of years before Alan joined his department around 1970, and it was Bud along with Yale Gracey who mentored the junior Coats. Alan remembers Bud as one of those terrifically talented Imagineers who also happened to be a terrifically nice guy. Martin had an office with Yale Gracey called "Systems Development" at WED, which handled special effects and show lighting at Disneyland and later WDW. According to Alan, "Yale was the department head and came up with most of those great illusions, but it was Bud who helped in a major way to bring them to life with his creative and clever lighting." Indeed, Martin's specialty was lighting and lighting design, especially in the service of special effects. In those days, when the cry went up, "Gimme a Bud light," they weren't asking for beer. According to Rolly Crump, Bud did all of the show lighting for It's a Small World at Disneyland in 1966. Rolly worked closely with him on that project and remembers him fondly ("Bud had a great sense of humor and was really fun to work with"). It's virtually certain that Bud did at least some of the special effects lighting for Pirates and Inner Space, and he was undoubtedly involved with the Haunted Mansion, where special effects lighting was—and remains—particularly important. By the way, in light of Bud's area of expertise, it seems very probable that he was directly involved in the ultimately fruitless efforts to get the notorious Hat Box Ghost to work, since the gag was done entirely with sophisticated lighting tricks. Alan and Bud were among those who went to Florida to work on WDW. Alan did the lighting for Small World, but Bud did the lighting for the HM as well as most of the other rides and shows. Back in Anaheim, Alan, Bud, and a few others did all the lighting associated with Mansion refurbs in later years. 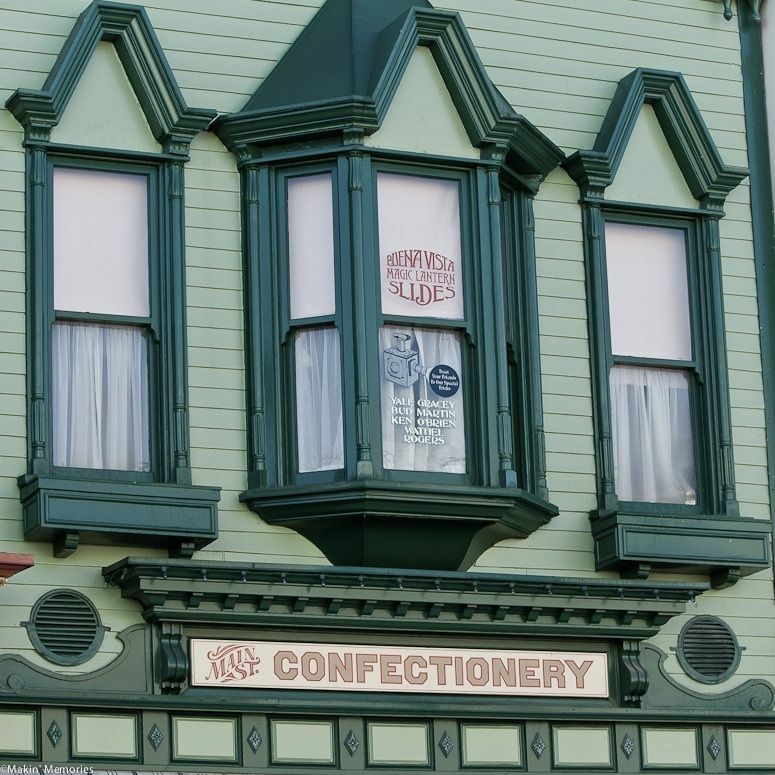 You'll find Bud in a Main Street window, above the Confectioner's shop at WDW. "Treat Your Friends to Our Special Tricks"
Bud? It looks like both men equally merit such a tribute. It's Bud. The author of these epitaphs, X Atencio, left a clue on the tombstone to prevent any confusion: "The lights went out on this old Spartan." That's an allusion to Bud's expertise in lighting effects and design. And yes, there are other instances in which the epitaphs allude to the areas of expertise of those being honored. 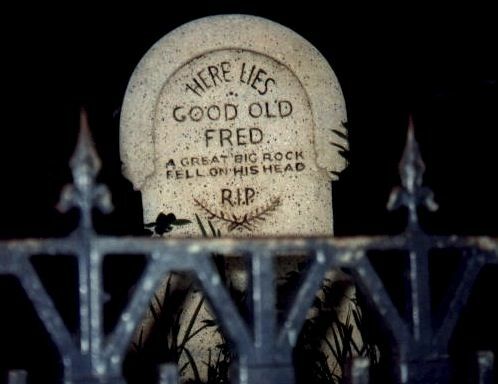 We recall that "Good Old Fred" cashed it in when "A Great Big Rock Fell On His Head." 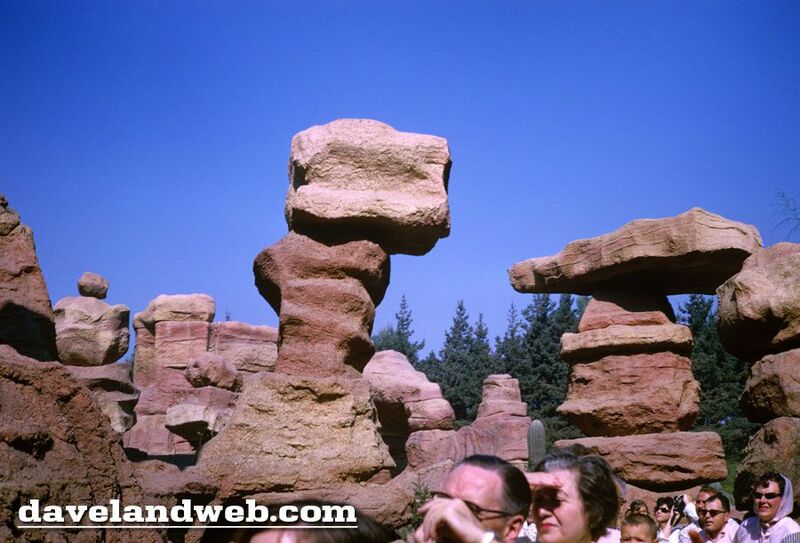 the parks, including such things as the memorable balancing rocks of the Living Desert in the old Mine Train Through Nature's Wonderland ride. models, along with Harriet Burns, Wathel Rogers, and Jack Ferges. 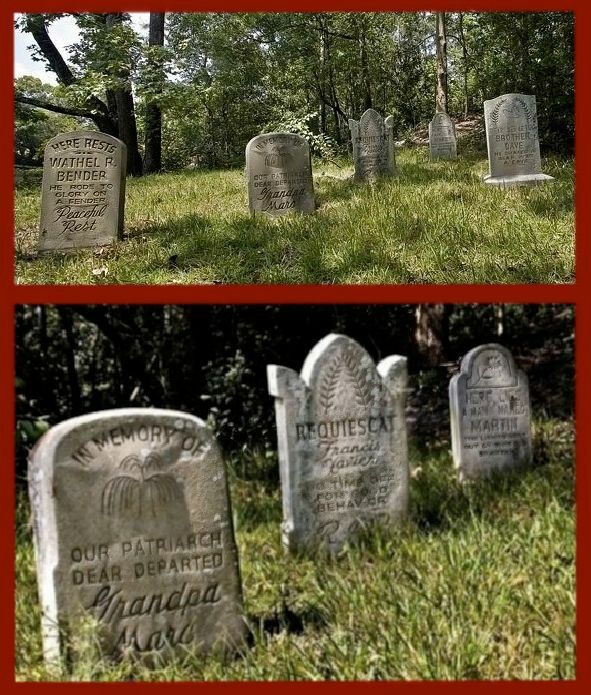 He was later honored with not one but two tombstone tributes. 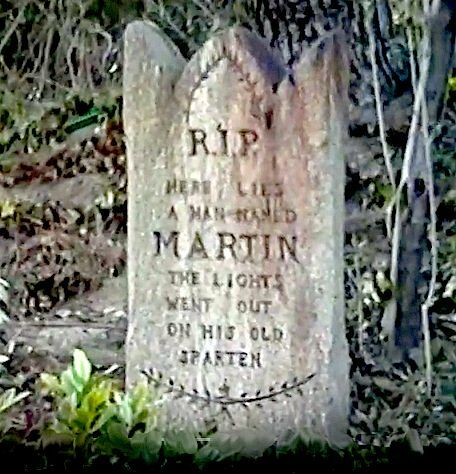 So with regard to our "man named Martin," upon whom the "lights went out,"
there can be little doubt that this refers to Bud Martin. Case closed. Let's assume they didn't make a mistake on the tombstone for a moment and see what some research can dig up. The spelling Sparten is not the same as Spartan. The 1914 Ed. of the Automobile Buyers' Reference mentions a car called the "Sparten" Electric (the guide includes the quote marks.) That would make "The Lights Went Out on His Old Sparten" make perfect sense: He lost power and the ability to see in his old electric car and BOOM! ...Tombstone. 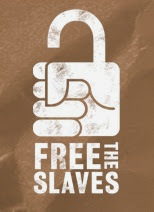 That's very ingenious, and certainly possible!